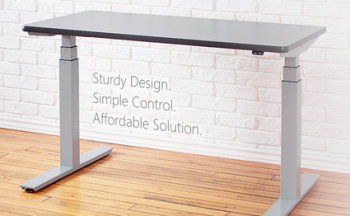 The upCentric Electric Height Adjustable Table / Standing Desk allows sedentary workers to easily alternate between seated and standing positions throughout the work day to achieve the health benefits commonly associated with sit to stand height workstations. Moving the table is intuitive with the easy-to-use up/down control. The quiet motors housed in each of the table’s legs ensure a smooth transition from seated to standing positions. 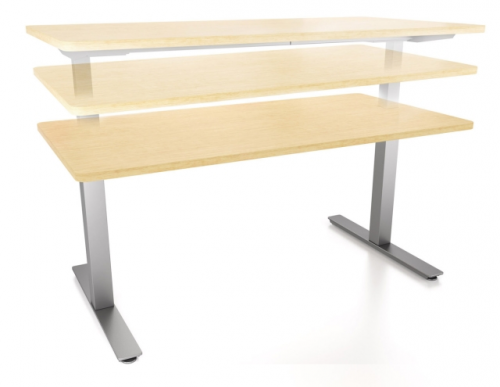 The sturdy upCentric frame design also provides width adjustability to accommodate a variety of different sized table tops with one table frame making retrofitting the table for new users and areas very economical. 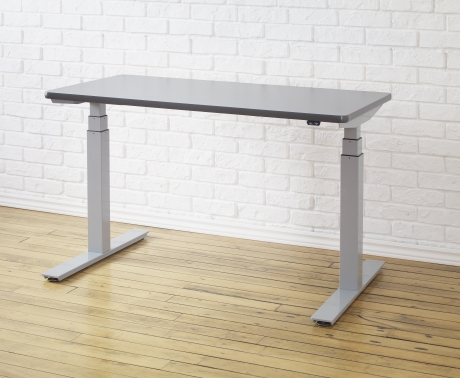 The sturdy steel base also features an open frame design to provide optimal knee clearance and storage space. 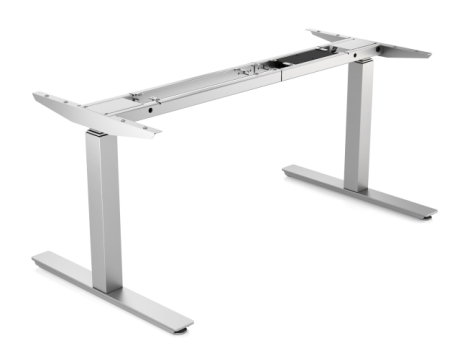 Dual Motor Adjustment: One motor in each leg creates high strength and durability in lifting table and makes adjustment fast and quiet. Height range: 23.5" - 50"
Width range: 41.25" - 71"
Accomodates tabletop size: 24" x 42" up to 24" x 84"
Boxed Size/Weight: 42.5" x 8" x 11" - 92 lbs. Width range: 46" - 77"
Accomodates tabletop size: 24" x 42" up to 42" x 96"
Width range: A: 46" - 77" | B: 42" - 71"
Accomodates tabletop size: 24" x 48" up to 84" x 96"
Frame should be lowered to lowest height (ideally) before moving on casters. Table should never be rolled while adjusted over 30" in height. Grommet holes - standard hole size 3"
1. 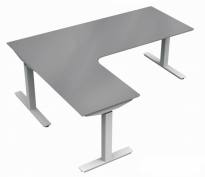 Ability to retrofit existing work surfaces: The sturdy upCentric frame accommodates a variety of different tabletop sizes to make converting existing work surfaces into height adjustable tables a very economical way of obtaining a sit-to-stand solution. 2. Maximum height range: With 26" of height adjustability, the upCentric offers the maximum height range meeting BIFMA-G1-2013 Standards. 3. Quick and easy installation: upCentric installation is fast and simple and can be done in less than 15 minutes. Written and video assembly instructions are available. 5. Energy efficiency: The upCentric features a low maximum power draw of just 30W while transitioning in positions. 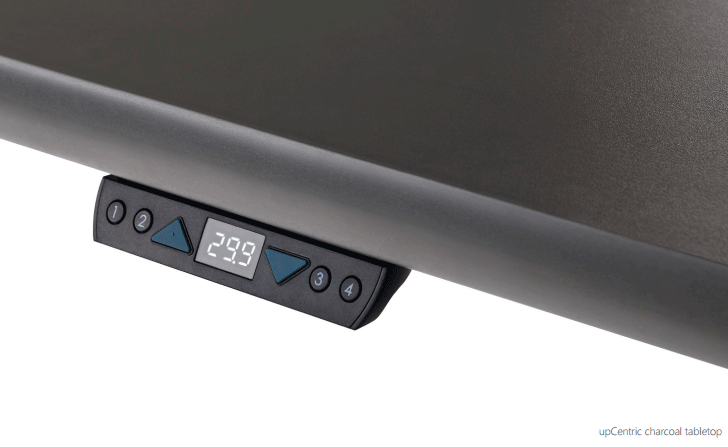 After 30 seconds of inactivity, the upCentric enters Sleep Mode reducing energy consumption to just 0.06W of power. What speed does upCentric adjust at? What materials is the frame made of? The frame is made of Steel. This is why it is so heavy, sturdy and stable. What is the upCentric table’s Max Height? And Min Height? What size table tops will fit on the upCentric table frame? How sturdy is the upCentric table? The upCentric table frame is incredibly sturdy. The frame its self weighs 93 lbs, because the frame and feet are made of this steel. This makes the tables not only stable and sturdy, but makes them quite bottom heavy. How much does the table frame weigh? upCentric Frames weight 93 lbs each. Does upCentric have and anti-collision feature? Does upCentric have an energy saving feature? Yes. The control buttons are connected into the control hub of the table with an Ethernet style cord. To change from the standard 2 button controls to the memory setting buttons, you simple unplug one, and plug in the other. Can we attach keyboard trays? Yes we can. There is a width adjustment bar that runs along the bottom of the table top, which is directly in the way of the keyboard tray track (it does not zig-zag out of the way like the ISE table), however, we are making “mounting kits” which will consist of 8 perfectly sized black spacers, and 8 appropriately sized screws, as well as detailed installation instructions and an assistive template. It will also be nicely packaged with marketing material inside so it looks like a really nice retail product, as opposed to a makeshift bundling of extra parts. How many motors in a table? There is one motor per leg in each table, so the 2 leg has 2 motors, and the 3 leg has 3. They are all synchronized by the control box, which all 3 legs plug into. This allows for the 300 lbs weight capacity fast adjustment, and quiet movement. Also, the gears are made of DuPont P.O.M (Poly oxy methylene) which is an incredibly high strength and density polymer made by DuPont. It is far superior to metal gears, which wear away faster, and make a lot of noise. What kind of motors does the table use? The motors, along with all the rest of the electrical and computerized components, are made in house by our component supplier – TiMotion. TiMotion has been making Linier Actuators, and all of the motors, control hubs, electrical components and parts that go along with them, since 2005. The motors and electrical components have been specifically designed for the particular use of height adjustable work stations, unlike many other companies that use generic off the shelf brand name motors. What material are the gears made of? Does upCentric have CSA certification and Ansi-Bifma certification? 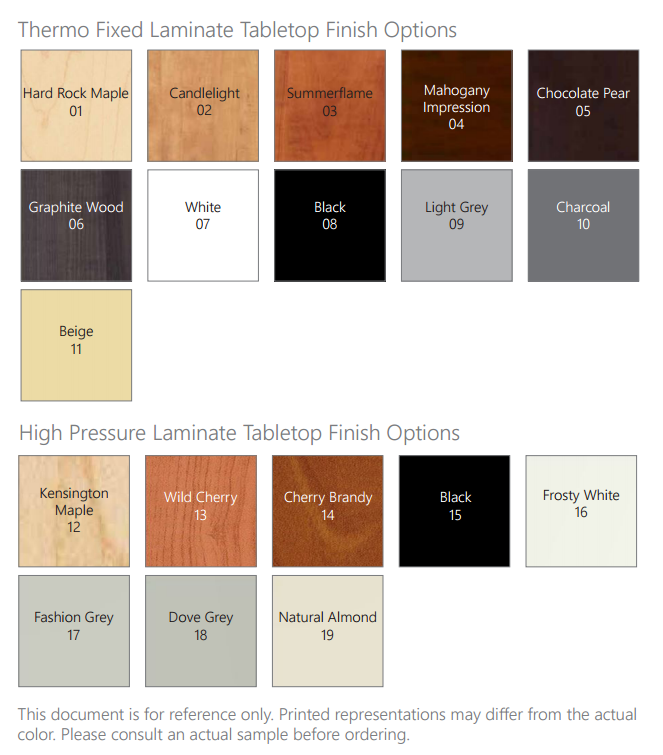 Yes, the upCentric Table has CSA/UL Certification and is Ansi-Bifma Certified. Do you have a Pedestal/Single Leg table option? Are the tables modular like your chairs? The tables are very modular. The legs and control buttons all plug into the control box so they can be disconnected and removed very easily if they ever need to be serviced. *These warranties shall not apply to any product which must be replaced because of normal wear and tear, negligence, abuse or accident or product use other than in accordance with written instructions and warnings. ergoCentric will repair or replace any product or material covered by this warrantee, found to be defective or inferior within the warranted period. This warrantee includes the cost of labor. Claims must be made at the store at which the product was purchased. Products or materials for which a claim has been made must be returned to the store. This warrantee is reserved for the original owner or user only. Warrantee is null and void if ownership is transferred. **Some additional conditions apply see in store for details. transportation difficulties, or other causes beyond our control.